When I was still working in a one of multinational company in Batam Island - Indonesia, I often set off on food to the food centre nearby just to have a quick lunch - dine in or take away. 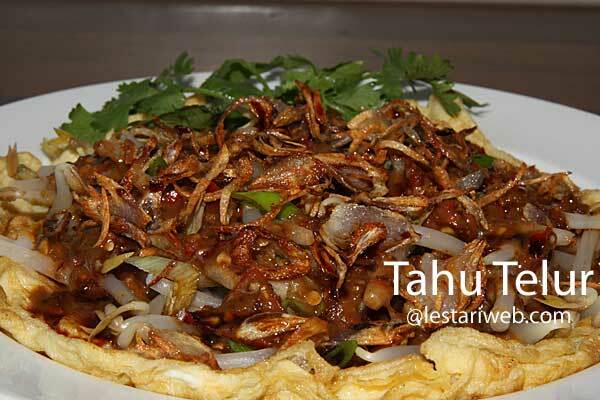 One of my favourite was warung "Arema" which served typical eastern Javanese dishes. The dish will be made accordance to our individual orders. Often while I was waiting, I watched and observed how they cook and what kind of ingredients they used. After 4 years I couldn't help myself to try it myself and at the end I've managed to come out with this recipe ;-). I have kept all ingredients in my head but the quantity I've decided to suit my taste. The taste is probably not so original as I used to eat at warung "Arema", because I have problems here to obtain the best quality of main ingredients such as shrimp paste. Nevertheless it worths to try it out and I was really satisfied. At least I have cried for joys or it is perhaps I put so much chillies on it ha ha ha.. Thanks and credit goes to warung "Arema" at Pujasera Batam. Anyway, are you still exist guys?? Soak the beansprouts in boiled water for 2 minutes to soften. Set aside to drain. Break eggs into the small bowl, add salt and use a fork to beat eggs until creamy. Add the diced tofu into a bowl and stir to mix. Heat 1-2 tbsp oil in a frying pan and pour the eggs and tofu mixture and make an omelette. Turn it over to fry the other side until both sides are brown. Making the Sauce: Put all ingredients for the sauce (except water) in a blender and blend until smooth. Add the hot water and stir to mix. Serving Method: Put the ommelet on a plate. Add the beansprouts and pour the sauce over it. Sprinkle the spring onion and fried onion on top. 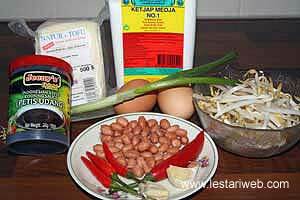 Then pour a little bit kecap manis over it.